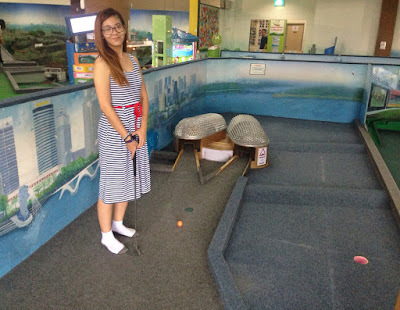 Frankly speaking, I've never heard of this place and never knew that such an indoor 18-holes mini golf course exist in Singapore. T and I were heading for the prawning place when he suddenly remembered about LilliPutt and insisted that we try out this mini golf course instead of the usual prawning. And of course, we met a really nice staff who saw the youth in us and gave us the student price of $16 instead of the usual $19.20. 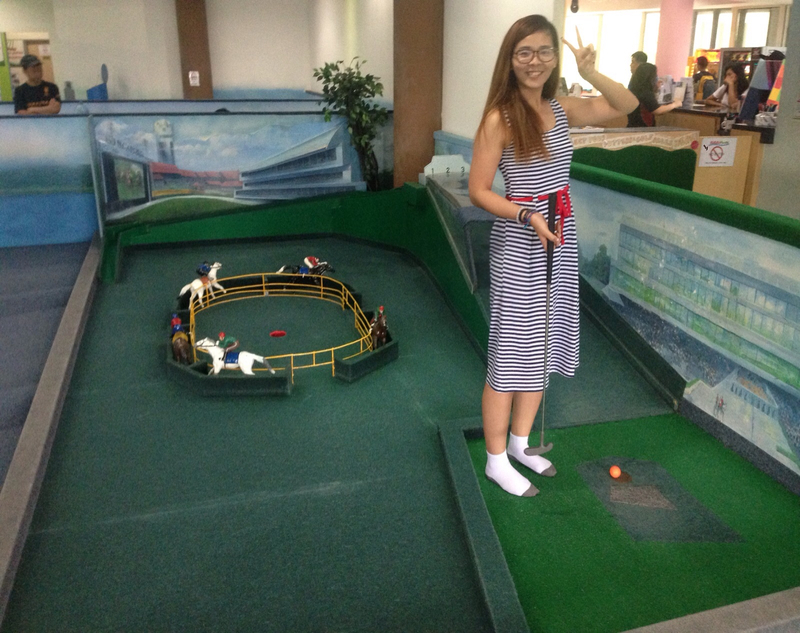 Shoes are not allowed in the golf course premise, so do remember to bring a pair of socks. If not, you can buy a new pair at $2. We were first given our putters and golf balls before the staff brought us into the course to show us how it's done. Basically, the 18 holes constitute of 18 mini (obstacle) courses, modeled after many of our local landmarks such as the Esplanade, Zoological Gardens, Turf Club, Haw Par Villa and etc. 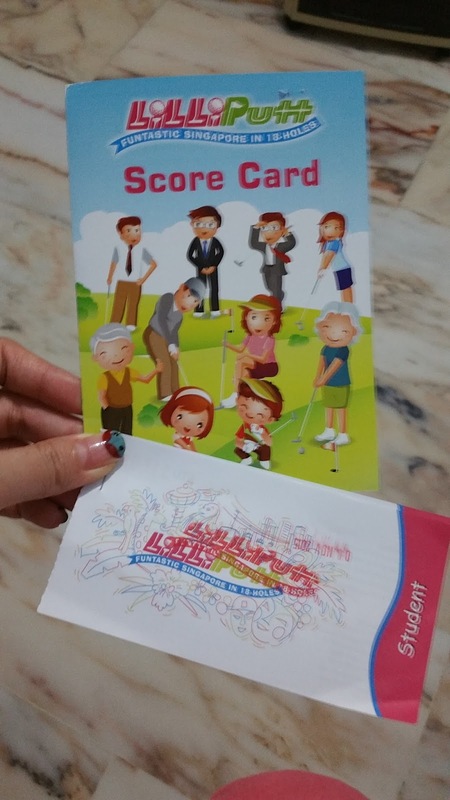 With the given score card, you will go through stations by stations, guiding your golf ball through the courses and try to hit it into the hole in maximum of 8 hits. There's no limit to how long you can spend inside the course, as long as you do not hit your golf ball into the hole at station number 18, for that is the final station and your golf ball will not come out after you've hit it in. And here's some of the stations. 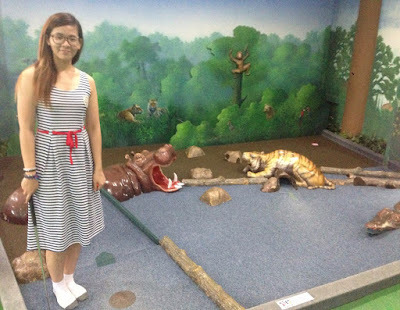 And do pardon me for looking chui because I always wear PJ-lookalike clothes and go make up-less with my oversized geeky glasses when I go out with T. Heh! Turf Club was one of the harder one because you might just get stuck at the first hit if you're unlucky enough to not catch the timing of the raising board at the top of the ramp. This Fountain of Wealth got to be the hardest of the 18 course. 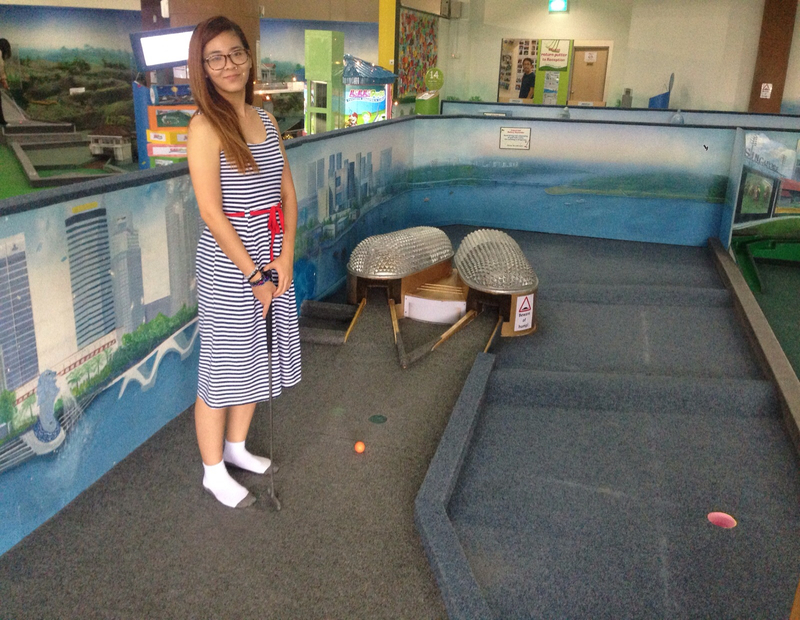 I think I took more than 8 hits just to bring the ball into the hole itself. Other than just ramps and obstacles here and there, there's also electrical mechanism set up at some courses for the golf ball to travel around. 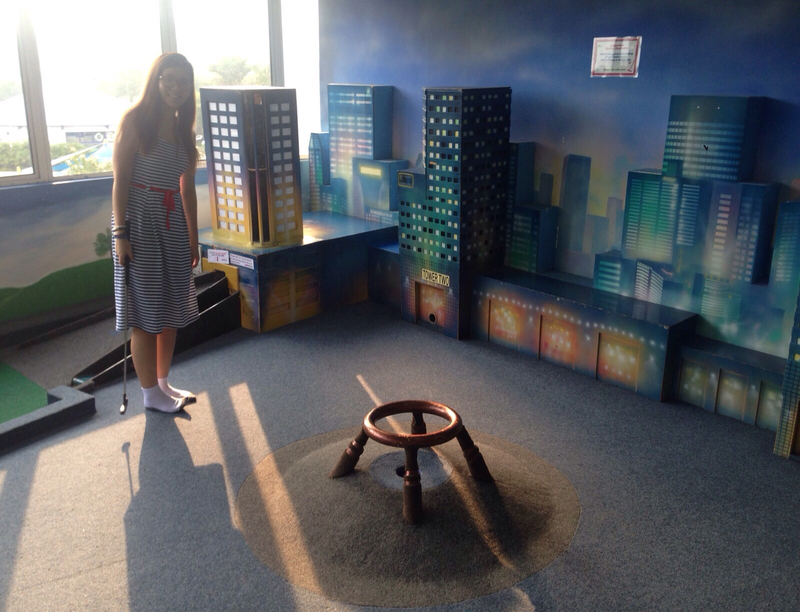 And an elevator for the golf ball to reach the top at the final station number 18. And now for my take on LilliPutt. Initially, I wasn't that keen on trying them out because it feels (and totally seems like) it's solely meant for kids or adults who refuse to admit that they've outgrown kiddy games. But I have to admit, I was wrong about this place. 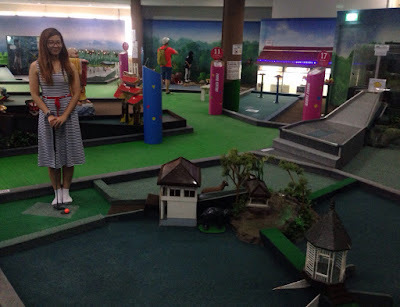 Although young kids (and their parents) do make up 90% of the crowd while I was there, I'll say this indoor mini golf thing is definitely not just for young children! It will be a perfect choice for a fun day out with your friends, or even a team building session with your office peers. 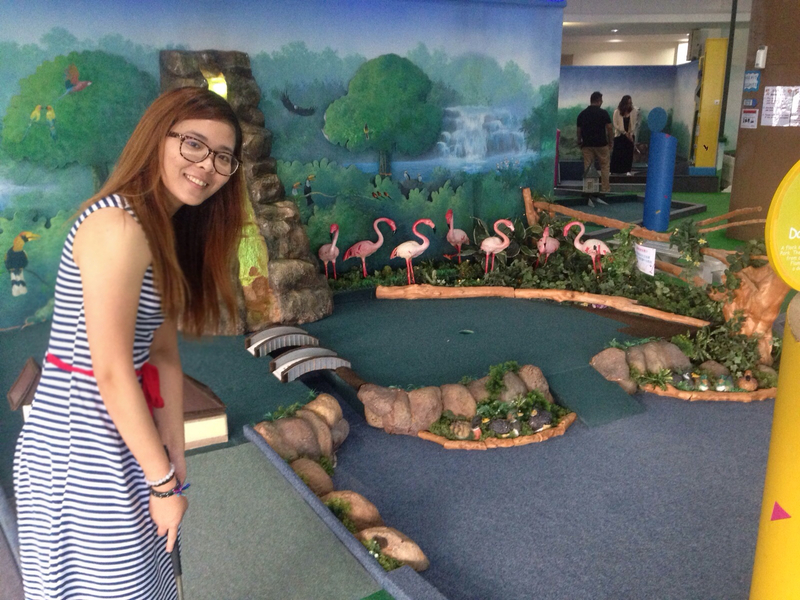 Mini golf is always a fun experience especially when you're with the right people. It's nice that they made use of your country's beautiful landmarks, that makes it much more enjoyable. 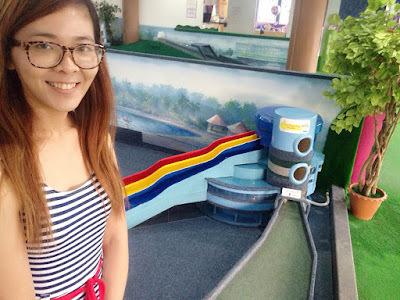 My kids love mini-golf, and you're right even though it does seem to cater to the young one's i love it too, Just the idea of putting a ball is a great feeling. Good to see that they've made the course quite challenging so that it would appeal to adults too. This is so cool! I'd like to try this one. I've watched a real golf game and it was just too sunny. This one seems a lot better. I hope to visit this the next time I go back to Singapore. Mini-golf was the vogue very long time ago. I do not think there is a new one in town anymore. Maybe if that succeeds to revive the trend, we may see it here as well again. This is such a fun event for the kids, I love playing mini golf with them as its not as tiring at the actual golf session. Children and adults can do this fun game altogether. The hotel with this kind of activity is really great. Tried this before and it's fun. What is chui? I tend to go makeup less when I go out lately too. You still look cute though!